Artist Books by Daniel Lehan. 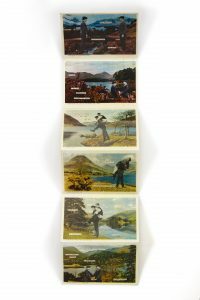 Handmade artist books and collage available to buy online. 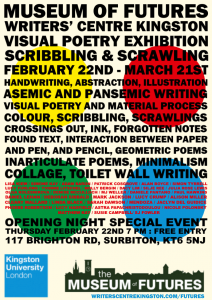 An open call exhibition presenting new visual literature on the theme of Scribbling & Scrawling – works that explore the handmade, the illegible, the dirty, the rough, the visual, the material, the calligraphic, the link – works which resist their content and express their context. Works that celebrate the notation, the forgotten, the colourful. 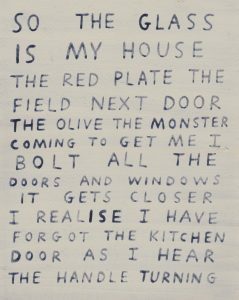 My – Young Woman Recounts Nightmare During Supper – 2014 – is included in this exhibition. Sarah Bodman’s ‘Holiday Recommendation’ – First Aid Courtship – is included on the Artists’ Books and Multiples blogspot – which is dedicated to Artists’ books, multiples, recordings, postcards, magazines and ephemera – and is published by Dave Dyment, artist, writer and curator based in Toronto Canada. First Aid Courtship is also included in the PORTFOLIO section here. 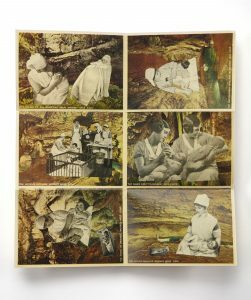 Wookey Hole Cave Creche is included in Artist Newsletter’s Top Ten Artists’ Books of 2017. Wookey Hole Cave Creche is also included in the PORTFOLIO section here.